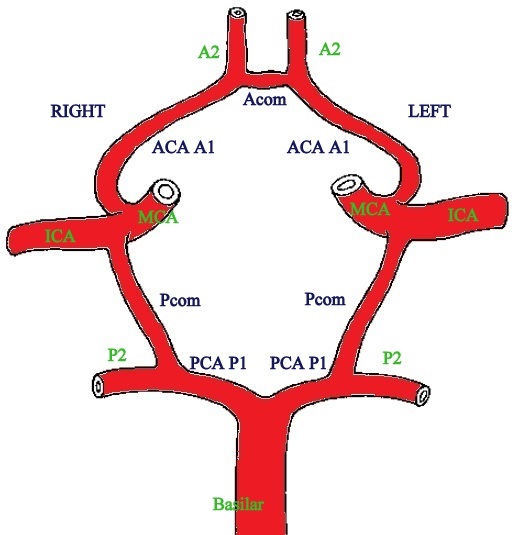 The circle of Willis is the ring of interconnecting vessels that encircles the pituitary infundibulum and provides important collateral circulation between the carotid territories and the vertebro basilar system. It is actually a heptagon, a seven sided structure, not a circle. Although it bears the name of Thomas Willis, named in honor of Willis by his student Lower who actually described this structure for first time. Vessel contributing in formation of Circle of Willis are ICA from either side and PCAs from Basilar. Right and left ACA A1 segments anteriorly from ICAs on either side and Acom in between. Pcoms from ICA on either side. Right and left PCA P1 segments posteriorly from PCAs on either side. A complete well-developed and symmetric circle is found in <50% of cases. In some 60% of cases, at least one component of the circle is relatively hypoplastic and diminished in its capacity to provide collateral flow. Sources of asymmetry in the circle of Willis. P1 segment: Hypoplastic in 15–22% ; Absence is Rare. 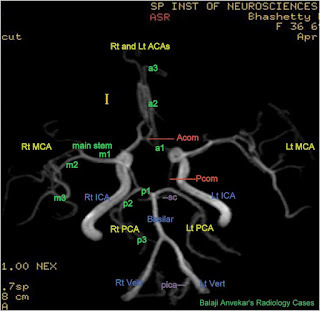 Asymmetry of the circle of Willis results in significant asymmetry of flow and is an important factor in the development of intracranial aneurysms and atypical ischemic stroke. Reference: Handbook of Cerebrovascular Disease and Neurointerventional Technique. Mark R. Harrigan, John P. Deveikis and Agnieszka Anna Ardelt.